Sitting atop the Avalon Beach Cliffs overlooking one of Sydney’s famous surf breaks Little Avalon. 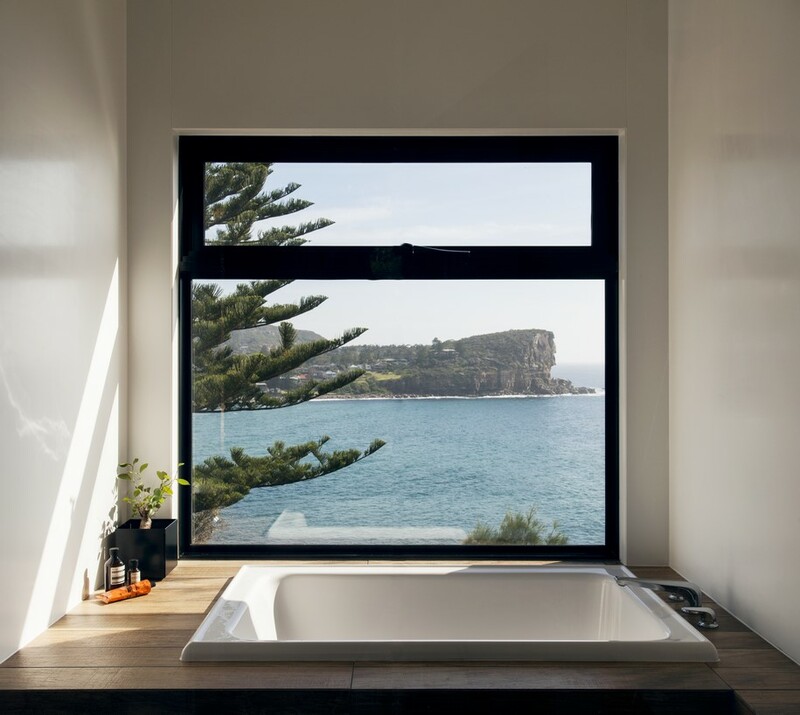 Avalon Residence is one of only a handful of house sites along this coastline that faces north, which allows for an east west orientation, with large windows capturing both the stunning views and northern sun. 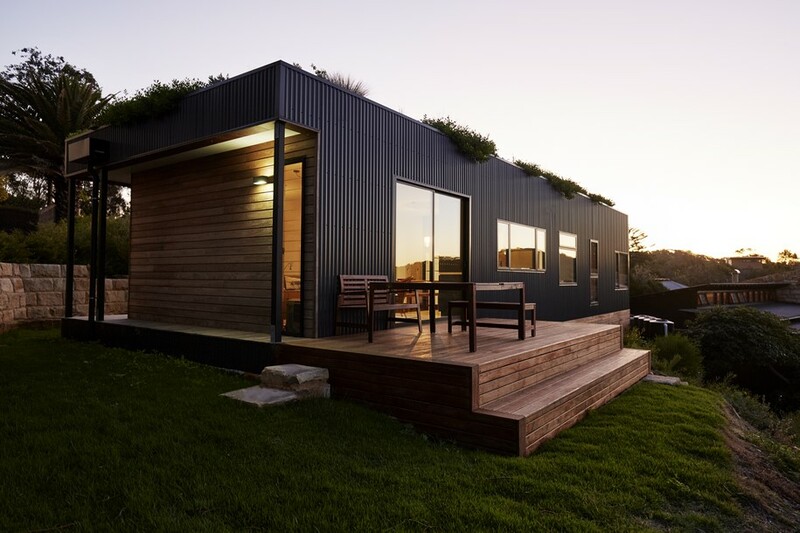 Situated on a sloping site, the small footprint home touches the earth lightly and is elevated off the ground on structural posts. 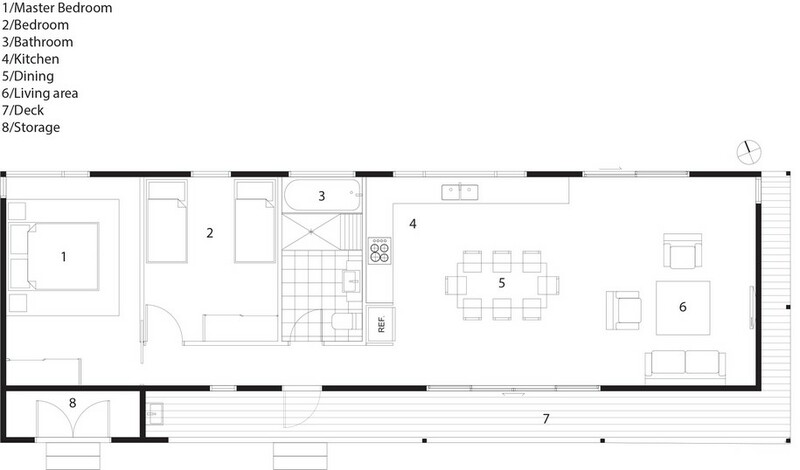 With a size of 106 m2 the residence is minimal in size but grand in design intent. 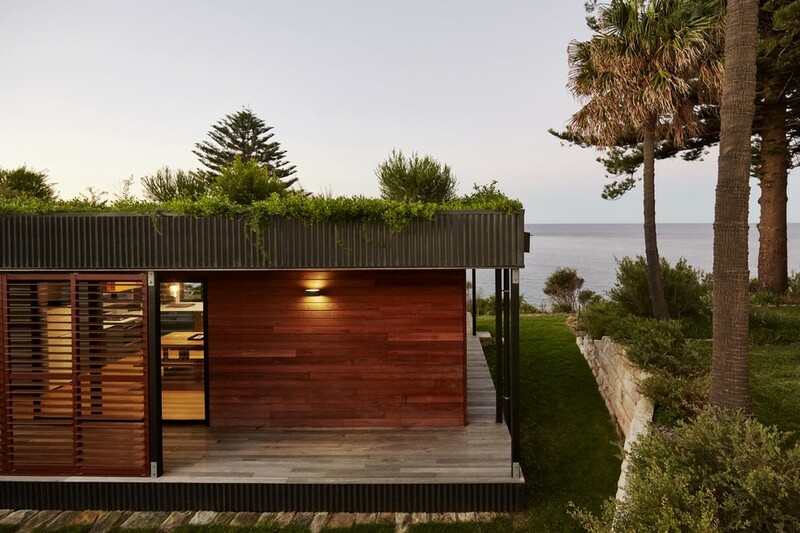 A garden roof crowns the house and allows it to merge back into the coastline. 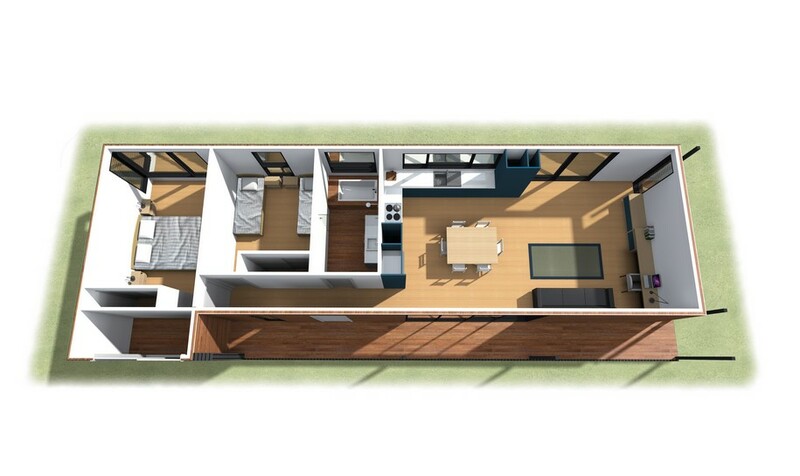 The interior is composed with 2 bedrooms, 1 bathroom, open plan kitchen, dining and living and storeroom. 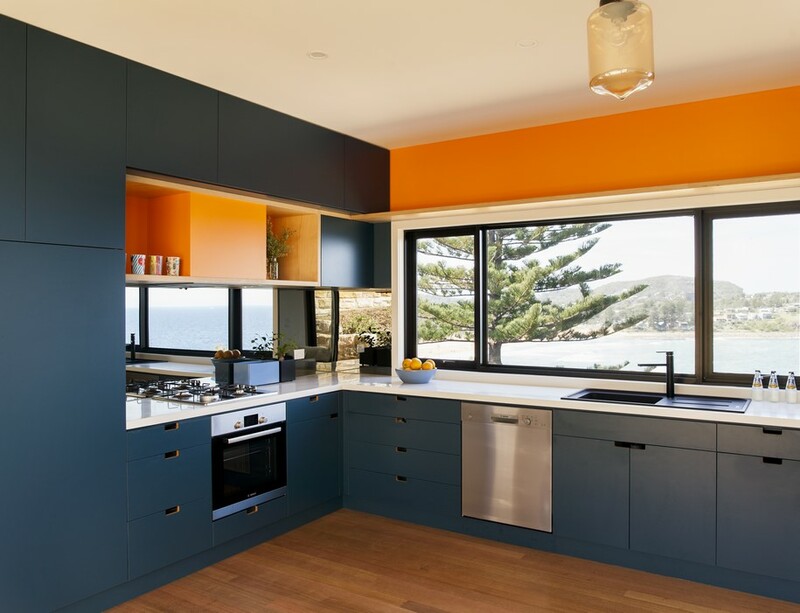 Inspired by the sea and sand, the couple chose blue and orange joinery colours. 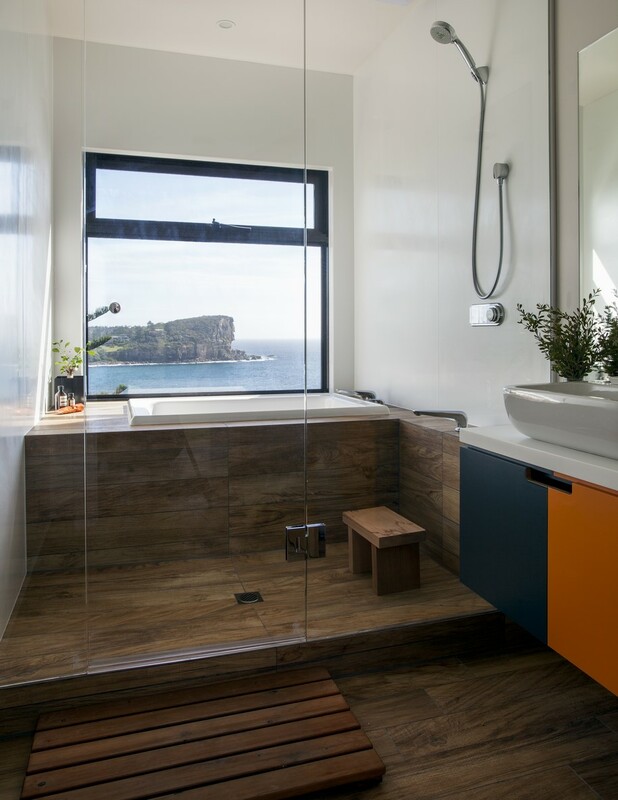 The residents, who previously lived in Japan, asked that the bathroom be modelled after a Japanese-style bathhouse. Wood-effect porcelain tiles line the shower and tub area. 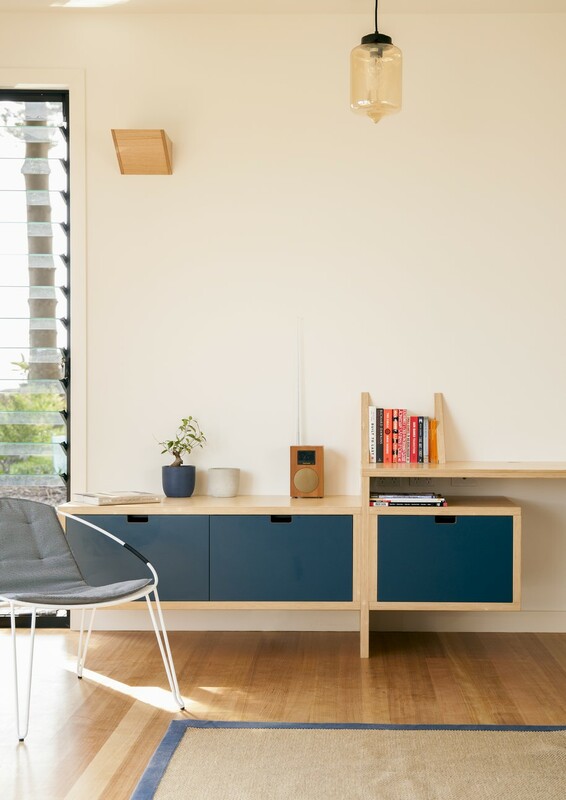 Minimalist and balanced throughout the whole house. 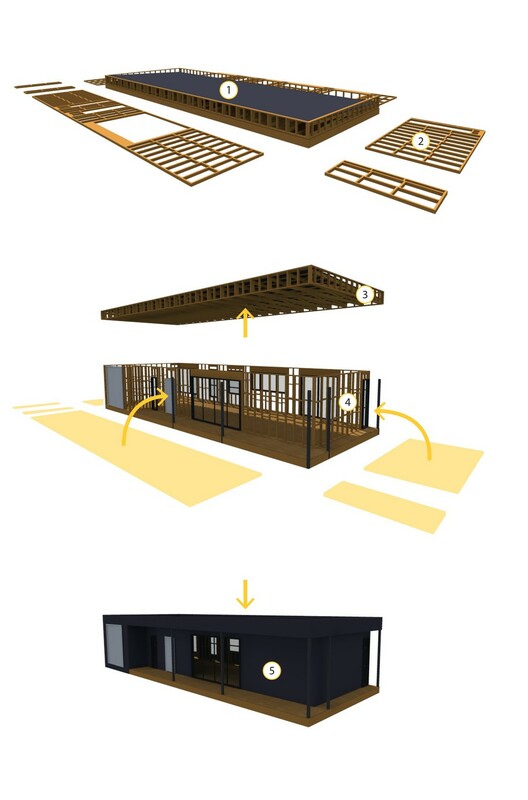 Japanese design always inspires and represents many of the qualities we love at ArchiBlox; opportunities to reconnect our lifestyles to the natural environment in a way that positively affects our daily lives with the acknowledgement of the importance of naturally occurring features, such as wind, sun, water, and materials. 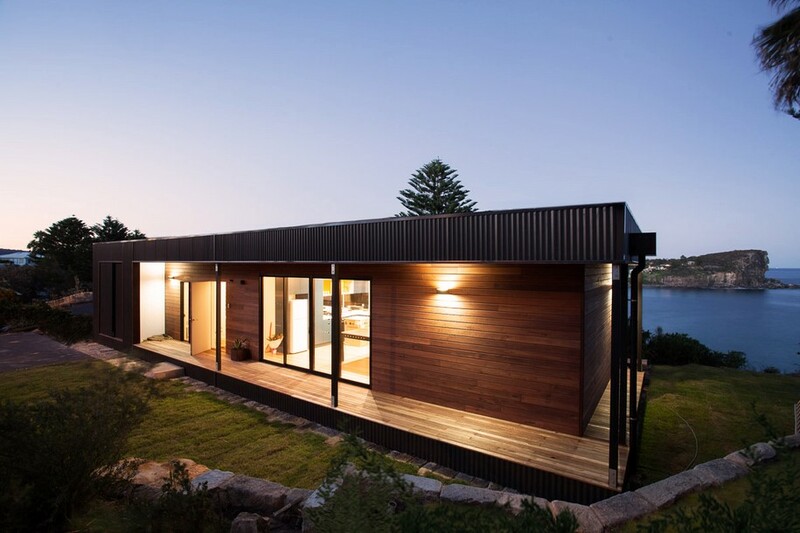 Beyond ArchiBlox’s speedy build time, prefab suited the clients desire to tread lightly on the land with the Avalon House project. 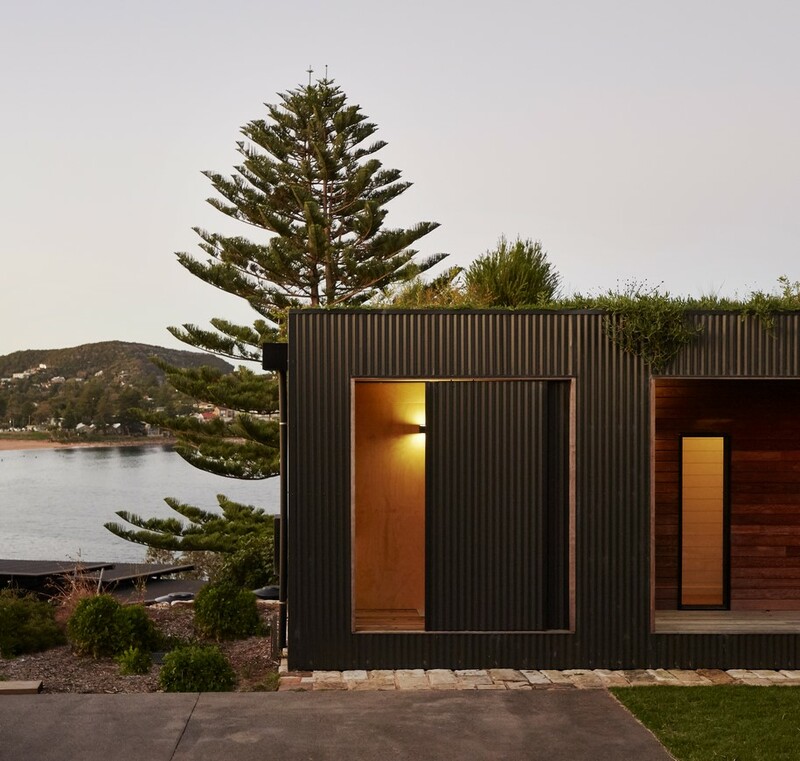 After a two-month design process and five months to secure proper permits, the house was installed on-site in just six weeks, meeting the clients’ deadline. 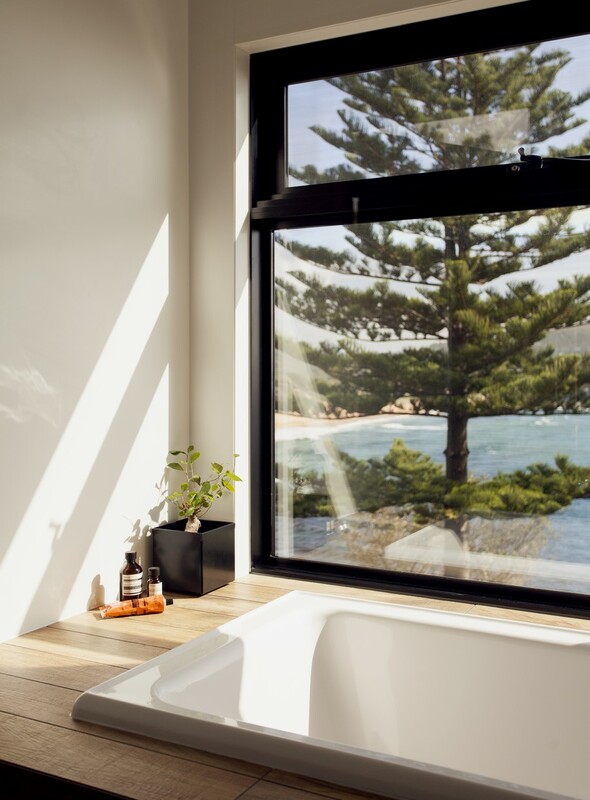 Operable windows are only required to be opened marginally to completely flush the air in the house out after a long summer’s day given the northwesterly wind direction. Their positions are maximized to capitalize on this feature. As strong prevailing winds come up over the cliffs, it was important that the northern interface had no protrusions. 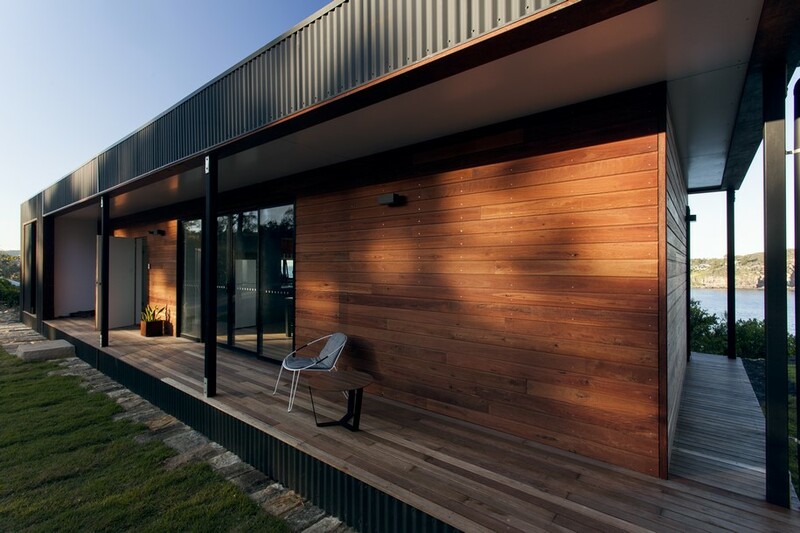 Louvres to the windows along the northern façade have been used to reduce solar gain to this interface. 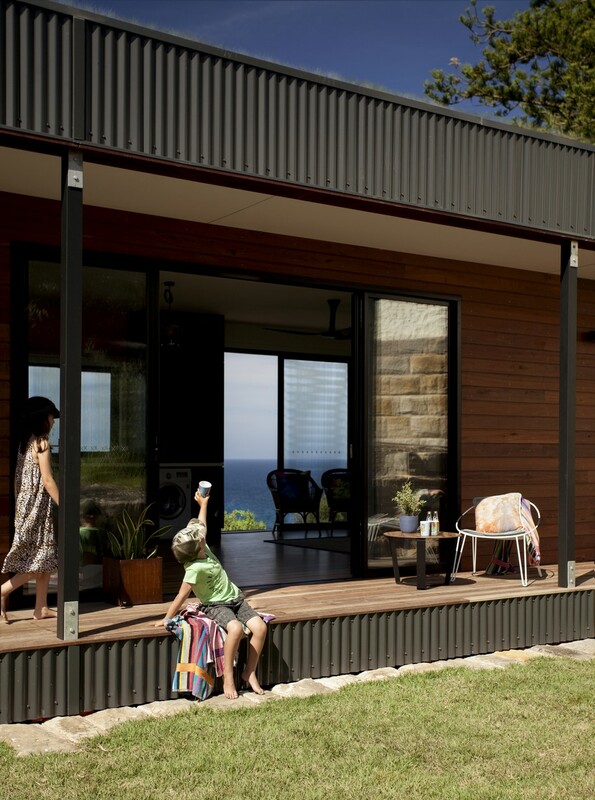 The bulk of the house is wrapped with corrugated iron by COLORBOND® Ultra steel range which is especially designed for severe coastal environments – where there may be a smell of salt or salt spray in the air, approximately 100 to 200m from breaking surf. 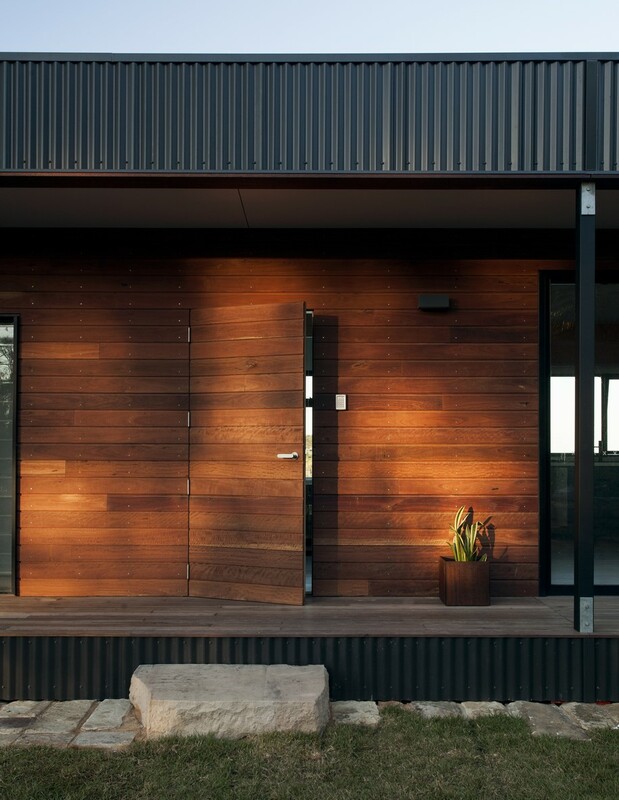 Blackbutt softens the north-east façade (facing the street and entrance to the house). 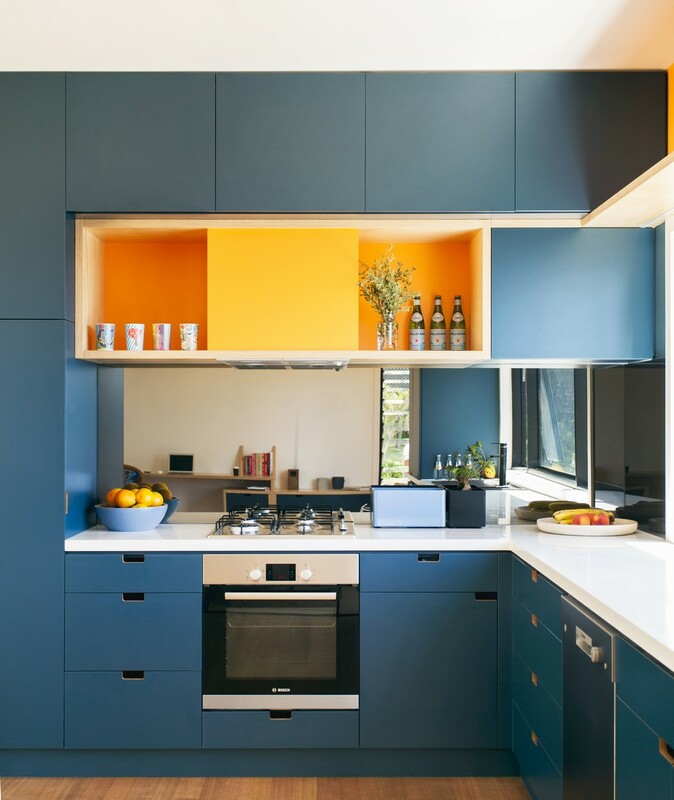 This is native Australian hardwood is FSC certified timber milled from sustainably forestry methods. 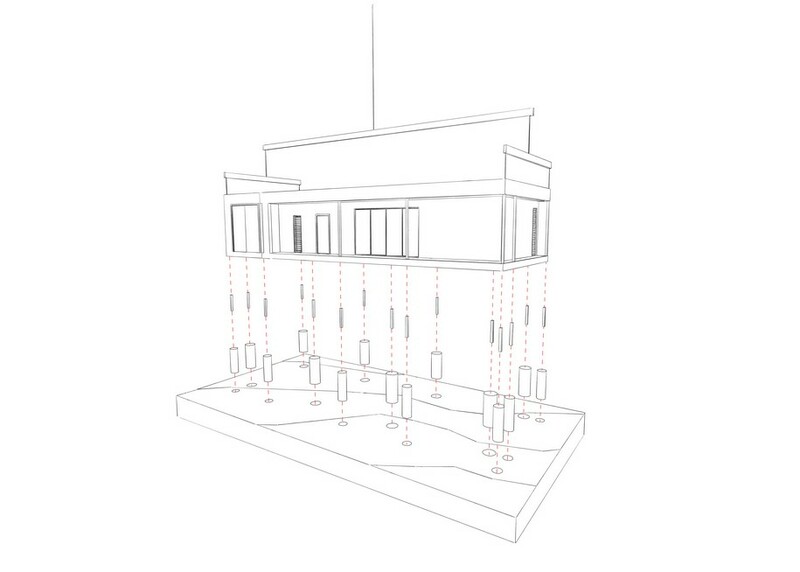 With this particular project, the main facades face north and given the type of footings used with this particular project, reduction of water flow across the site was a consideration with its proximity to the cliff edge and potential erosion. Building with a concrete slab or strip footings would have been problematic as would have created a barrier to water flow.